An assassin trained in the ways of the dark side by Count Dooku, Asajj Ventress yearned to be considered a true Sith, but such status wasn't allowed under the Sith's Rule of Two. Ventress fought with twin red-bladed lightsabers, and clashed with Obi-Wan Kenobi and Anakin Skywalker many times. But her destiny would not lie with the Sith. 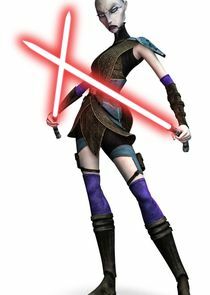 After Dooku rejected her as his apprentice and tried to kill her, Ventress returned to her roots as a Nightsister, made a living as a bounty hunter, and – in the strangest twist of all – rediscovered the way of the light that she'd rejected long ago as a Jedi Padawan.